WOW! 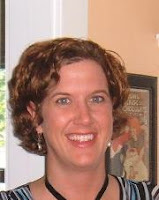 Women On Writing Blog: Creative Nonfiction: How Creative (Um. . . UNTRUTHFUL) Can You Get? Creative Nonfiction: How Creative (Um. . . UNTRUTHFUL) Can You Get? As the popularity of creative nonfiction increases, the genre brings up an interesting debate: is every word supposed to be true? If events are recorded in a memoir, were they supposed to happen just that way? If a writer is investigating a true crime, is it okay for her to make up dialogue between the criminals if she gets really close to what was probably said? Recently, I read the book: You Can't Make This Stuff Up by Lee Gutkind, who is the editor and founder of Creative Nonfiction magazine. The book discusses what creative nonfiction is, provides popular examples done well, and instructs writers how to create a nonfiction piece. Creative nonfiction is a nonfiction story that is told with fiction elements: dialogue, setting details, scenes, characterization (of real people), and so on.That's where the creative part is supposed to come in--not in the facts--but in HOW the facts are revealed. Part one of Lee's book would be interesting to anyone who loves to read and discuss what they read. The author writes about some of the most infamous cases of writers who claimed to write a true, nonfiction account of their lives; when in all actuality, it was false—sometimes the entire story made up. The account most people know about is James Frey and his book, A Million Little Pieces, since Oprah chose it as one of her book club selections. Because of her recommendation, two million copies of his book sold, and Frey became a household name. Then it was discovered that most of his story was completely untrue. He did more than make up some dialogue or create a composite character for simplicity sake--Frey lied. This is one of the extreme examples that Gutkind discusses in his book during the ethics section; but there are actually more writers (more than I realized!) that fudge the truth just a bit. But still, they claim that they write creative nonfiction. For example, David Sedaris admits that because he writes humor based on his life, that sometimes he must exaggerate or make up dialogue to get a laugh. Some of the funny lines in Naked? Completely fabricated! John Berendt made up dialogue and rearranged the story chronology in Midnight in the Garden of Good and Evil! Several people from Frank McCourt's home town claim that he didn't exactly tell the whole truth in Angela's Ashes, and they state they've found over 100 discrepancies. 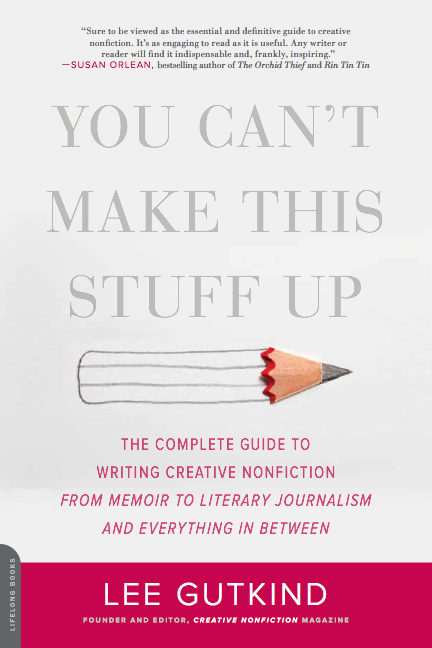 On his blog and in his book, Gutkind writes that he can accept some "exaggerating an event or situation, or compressing time periods, or creating composite characters" and that it "may possibly help a nonfiction writer make his or her point more effectively—although I believe this is only rarely truly necessary." It’s a crucial decision for writers to make if they are going to tackle the genre: are they going to tell the truth without embellishments? Personally, I was disappointed when reading this section of Lee's book--so many writers don't stick to the 100 percent truth. But then I thought: maybe it's really difficult to do this--I don't write much in this genre, so maybe I don't know. I have written some essays, and I have included dialogue, and I think I have the dialogue right; but it's as I remember it--so who knows for sure? How do you feel about this issue? 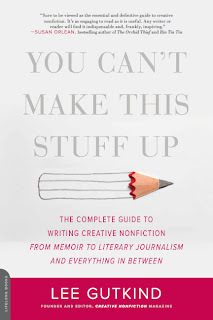 How much of a creative nonfiction piece is it okay to "make up"? If you write memoir or creative nonfiction, do you create dialogue or make up characters, etc, to smooth transitions? As a reader, how do you trust the writer? I started thinking that perhaps books should say on the cover: Based On a True Story--just like many movies do. . .
Good questions. I think creative nonfiction, since it is based on our memories and perceptions, is always going to be partly fiction. That may be unintentional, but there are good reasons to intentionally alter truths, too. Like the example of exaggerating for humor. I've written creative nonfiction that is as close to the truth as I can get, but I've also written pieces that take several scenes and combine them into one, or take events out of order to make the story smoother. I like this quote from Pam Houston, who writes "fiction" but her stories seem mostly nonfiction: "Everything I write is 82% true." Interesting discussion! I like how Ben Mezrich handled it in his book The Accidental Billionaires (the book they based the movie The Social Network on). He included an author's note in the beginning that said the book was a dramatic, narrative account based on dozens of interviews and hundreds of sources, and says that he uses literary techniques like re-created dialogue and scenes to move the story along. Because many of the conversations took place in different settings and over time, so he wanted to put them all together. So it's kind of like your movie disclaimer idea, and I liked that he was up front about it because the book is supposed to be nonfiction. I feel nonfiction should be as true as possible, but I don't have the same expectations for memoir. I don't know why, but I guess it's because a good memoir is intimate. You get to see through a person's eyes and live through her flesh. So I don't mind David Sedaris embellishing a bit in his stories--it's like a friend telling you what happened over dinner. There are those friends who tell a great story! And you often wonder if it's all completely true. But I think a book like The Immortal Life of Henrietta Lacks should be as accurate as possible because the author is uncovering an important scientific story about the start of the human cell cloning industry some sixty years ago, and involves an entire family over decades. Those are just my feelings, and I don't know if they make sense or not. It makes you wonder if the person who invented the saying "Truth is stranger than fiction" wrote creative nonfiction! Yes, I'd read before that David Sedaris has been known to "embellish" his work for humor's sake. And as one who frequently writes about the humorous goings on in my life, I think that's okay--as long as the gist of the event remains true. If you're making up an entire event, well, then, that's fiction and should be called such. As for John Berendt, I was not okay with the way he manipulated the time line in his book. If he'd said, "based on true events", I wouldn't have minded so much. But he placed himself in the story AFTER certain events had transpired and he won awards as a non-fiction book. I'm okay with a writer playing around with dialogue lines, but messing *with* events crosses the line. Thanks for the insight here as I struggle with how (and if) to tell my life story. Thanks for the comments, everyone. I do understand how hard it is to remember things factually--as in memoir or humor stories--we do the best we can according to our memory and as long as we aren't creating things like going to jail (I mean you just forgot you didn't go to jail? ), I can see how the spirit of truth is there. And I agree books like Rebecca Skloot's should be as close to truth as humanly possible. I think my problem is 1. I'm naive 2. When I taught elementary school, we used to teach kids test taking skills. We told them that when answering true and false statements, if ANY PART of a statement was false, the ENTIRE STATEMENT was false. So. . .I guess that's where I am with all of this. I do think a disclaimer helps, somewhat. Good discussion. I am reading one of Gutkind's other books right now, and exploring Creative nonfiction writing myself. I like what everyone else said. As close to true as is possible. When I read a supposed "creative" nonfiction book, I assume some dialogue or details are embellished, because unless you recorded those conversations, how could you possibly remember every word that was spoken!? I think if you get the gist of the scene correct, the feeling, and perhaps ask those people who are portrayed in the scene if you got it correct, then you're just about as close as you can get. Thanks for the post! Humor writers get a certain amount of wiggle room, but if anyone else fudges dialogue or the timeline than it is fiction based on actual events. I don't care of you're John Berendt or Ben Mezrich. Maybe its because I came to this world via academia (history and archaeology/anthropology) but you do not fudge the date.